Well, what can I say about us? Me, Lucas Mattos, and João Brant were both born on Belo Horizonte, a huge city in the middle of Brazil. For João, working with video games was so obvious it wasn’t even a choice. For Lucas, pursuing the most multi-disciplinary way of expressing yourself naturally led to games. We’ve met while studying Computer Science on the local University here, and quickly discovered that we shared the same interest. One year before finishing with the course, we agreed that we should make one try for this dream job we had. That was basically when Long Hat House started. As we have more or less the same skillset, we do more or less the same roles: game design and programming. After a while, we met Victor, our pixel artist, at a local Belo Horizonte event he was organizing, and shortly after, started sharing an office with him. In the beginning of 2017, after working side by side with us, he decided to join the team and work on Dandara. Thommaz, the musician and sound designer from São Paulo, joined us way before, but we knew him through Victor and other people at the office. He works with us remotely. So we are four people now, and it’s been awesome! Could not expect a better team! Question: You’re not the first Brazilian team to get into Stugan, I’m guessing there’s a game dev scene in there. Is it indie or AAA? While we have some big companies trying to reach AAA level, we still have a long way to go. But the indie industry is growing more and more each passing day! I mean, compare BIG, our biggest local event from its first years to now and you’ll see a huge difference. Even in Belo Horizonte the scene just keeps getting bigger and bigger. At every event or forum you can find a new inspiring game made by a really nice person or team. Quality is rising steady and fast. Q: What did you think of the industry at first? Are there any associations or networks for game developers? It felt super exciting to be one of the pioneers! It felt like we were a the tip of the spear doing something amazing together with a few people. Victor started organizing MIND, the indie game event, where we could show games to each other and have feedback. He did that after talking with Saulo, a super cool guy who is in charge of both a super successful indie studio called Behold but also spurring his own events back in Brasilia. Q: What kind of events do you have in Brazil? Is the government helping you in any way? Obviously, I meant pioneers in the context of Belo Horizonte. All around Brazil, which is a really big country, we could see a bunch of other spurs and movements like this. With the events, associations also begin to pop up, and last year was important because we got one for the region of Minas Gerais. The government right now is in a place where it wants to invest in games, but really doesn’t have a clue on how to do it, and these associations are important as a way to communicate to them. So, in a few words, everything is still kind of small, but we can see change quite clearly. Q: Do you think your environment is affecting your work? How so? Of course! I mean, we are adepts of the idea that getting inspired by things that you see on real life is good for innovation, and we do tons of that! Brazilian media also inspires us to do a bunch of stuff. What is good about that is that for the outside world it feels novel and innovative. Nobody knows exactly what happens in Brazil from a few movies, and that’s even more true about other regions that aren’t around Rio or São Paulo, like our home city. Q: Tell us about Dandara and why did you apply to Stugan. Dandara is an exploration game with battles. You’re born in this weird world of Salt, which is more like an enormous cave and you’re tasked to free it from it’s own perils. It began as a touch screen game where you only drag around the screen to do everything, that’s why the movement style in this is so different. We did apply to Stugan to mainly develop content for the game around talented people. Dandara is in a fairly completed state when it comes to game design and finding the fun. But stuff like level design, sound design, and UI: those need constant improvement. And from that we need to get up there and show the game to people as much as we can. Q: How has Stugan helped you? Feedback has been very important to us since the beginning, and now we are having the privilege of receiving a lot of it. Then we have mentors as well, with their more experienced views of the world, and with all that we can really think outside the box to improve the game. What we didn’t expect for as well was the environment here. We are around one of the most beautiful and peaceful pieces of nature we’ve ever experienced in our lives. After working on this for around 2 years, you can really start grinding and your creativity seems to stop on its tracks. It feels like a super fresh start for all of us a release from some stress and that was really amazing. It is really important for the game and will do wonders for the end result. Q: You’re with Raw Fury. How is working with them helping you? How did you approach them? We cannot say anything less than absolutely amazing! WIthout them, Dandara would be a really unknown game coming out for mobile, then PC, that would at best be treated like a rare gem. Now, we are going to launch on all kinds of places, including the Switch. At the time of the announcement of our collaboration, we felt like being the first fully Brazilian studio launching on a Nintendo console. We treat that as this huge responsibility, and none of that would be possible without Raw Fury. 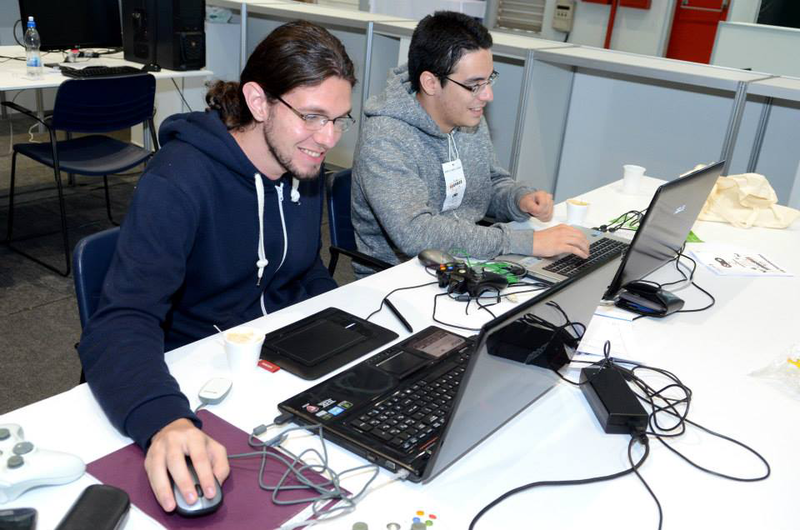 Before, we just have been finalists in BIG Festival, a huge brazilian event at São Paulo, when we concluded that there was still a lot of work to be done in the game. That would meant doing more and more freelance work in order to support ourselves. Not wanting any of that, we felt that maybe we could keep our eyes open for some publishers. Shortly after, we found Raw Fury’s article at Gamasutra about their publishing philosophy and we absolutely loved that. We sent them an e-mail about Dandara and it just went on smoothly from there. Q: What kind of difficulties are you facing right now? We are working on finishing the content of at least the critical path of the game. The goal is to quit just completing the game and start finally improving and polishing the game. Naturally, we are needing to test the game and polish our level design. It is really hard to test later parts of the game, when the player there should have learned mechanics more easily explained in the first parts. So we need players to stay with the game for more than 2 hours to get to test stuff like tutorials, challenge and flow. 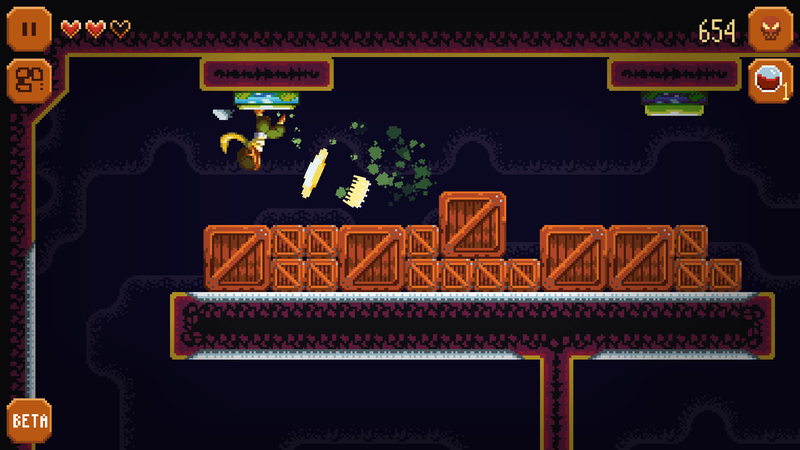 Turns out that making a really polished metroidvania is not an easy task! Stugan gives us a way better position to do this, of course, but it is still very hard to polish stuff while the whole isn’t done yet. So we are running to finish it all as fast as we can. Q: What kind of games would you like to do in the future? it up a bit for the next game. Long Hat House wasn’t never meant to focus on one kind of game, and we really want to steer away from that too. Wacky funny and horror games are some of our passions and we would give a try to those as well. Right now, we are talking about maybe taking a break from long games with lots of level content to make a more simple game, maybe something with just a couple of levels (like, for instance, a local multiplayer game) where we can focus on polishing the entire design (game rules, UI, visual and sound feedback) to communicate perfectly with each other. That has been really hard to work on Dandara because we always need to focus on lots specific details in specific levels, something that you don’t really foresee when you start working on a metroidvania. Q: What are videogames for you? An incredible art form that is an amalgam of everything we had thus far, like cinema, writing and music, with interactivity slapped in. It has just so much value in it! We love to play games, it is like a conversation with yourself or with the other people playing with you in another language. We love to make games as well, there’s just so much you can apply on it and every day you discover another lens from which you can see a game in a different way. And finally, we really like to see people’s faces when they play something made by us. Of course it is horrible to see them dislike it, but the risk is part of the fun. There’s many more things and I could go on and on about this, really! To know more about Dandara, click here. You can also follow Long Hat House on Twitter, click here.